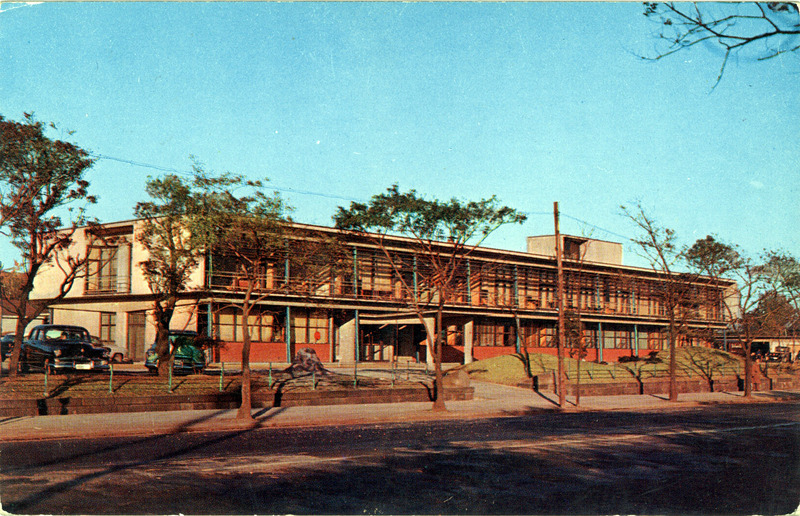 Reader’s Digest Building, Tokyo, c. 1955. “The postwar rebuilding of Japan began masterfully with a work of [Antonin] Raymond’s Reader’s Digest Building at Takebashi, the first ‘permanent’ new building in Tokyo since the end of World War II. “Raymond had petitioned General MacArthur for permission to reenter occupied Japan in order to participate in the work of reconstructing the country. Arriving in Tokyo in 1947, he discovered former staff members had painstakingly preserved all documents and drawings left behind ten years earlier and only awaited his instructions to reopen the office. “… The building for Mrs. Wallace was a two-story longitudinal structure recalling [Raymond’s] Tokyo Golf Club in scale and layout, though not in its construction or details … [T]he Reader’s Digest Building was to benefit from a decade of prior activity in America during the war on Raymond’s part .. [T]he latest technical innovations and materials available in the United States were now copied in Japan under his supervision. These included such things as both asphalt and acoustical tiling, under-floor ducts for electricity and telephones, fluorescent lighting, a heat-pump system, and floor-to-ceiling glazing.